Spring is here and judging from the weather outside it still feels like late winter with temperatures throughout the nation hitting highs in the low 50’s this week. In fact the warmest parts of the nation: Hawaii and Florida are only experiencing highs in the low 70’s today. It’s best to keep your winter outerwear, sweaters and scarves out a little while longer this season, since bundling up is going to be essential for staying warm this spring. 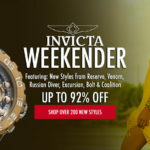 WorldofWatches.com is offering another form of bundling up for spring this week with their Swiss Legend Bundle Blowout promotion, featuring bundles sets of highly sought-after Swiss Legend watches with quality Swiss-made quartz movements at prices starting at $49.99. Yes! 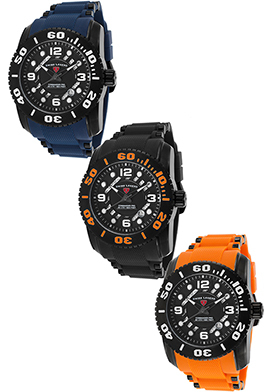 For just $49.99 you can get two Swiss Legend watches from the brand’s Neptune, Traveler and Expedition series. 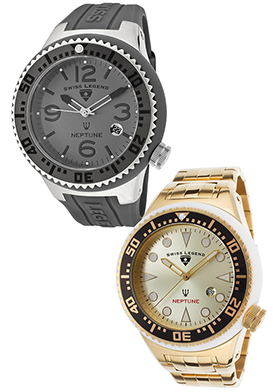 The Neptune men’s duo is a great sleek and sporty choice. 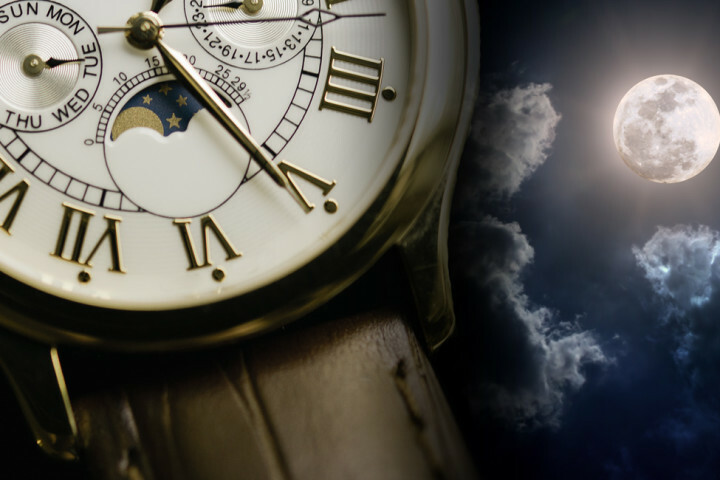 This bundle includes the classic Neptune wristwatch with a 52mm stainless steel case, gray dial and matching gray silicone strap along with the Neptune Force timepiece with a 52mm yellow gold-tone stainless steel case, matching bracelet and dial. 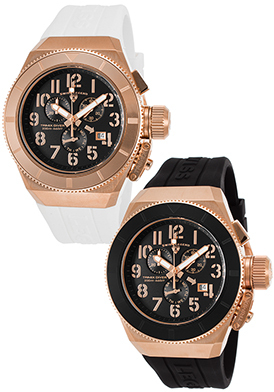 Both watches have screw-down crowns and case backs for water-resistance to 100 meters. You’d expect to pay $69.99 for one just one high-performance Trimix Diver 2.0 men’s chronograph from Swiss Legend. Yet the bundle features a pair of chronographs from the popular collection with 43mm wide Tonneau shaped cases in rose-gold tone stainless steel with black dials, presented on white and black silicone straps. 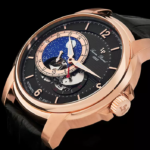 Both watches have luminous hands and rose-gold tone Arabic numeral hour markers, along with screw-down crowns and case backs for water-resistance to 200 meters or 660 feet. The Commander Pro bundle set of three, priced at $89.99, offers great color options with stylish silicone straps in navy, black and orange accented with black plated steel trim. Each of the three watches has a 47mm diameter case in black ion-plated stainless steel, black plated steel unidirectional rotating bezel and legible black dial with a semi-skeleton date calendar, luminous hands and hour markers. Screw-down crowns and case backs provide water-resistance to 200 meters. 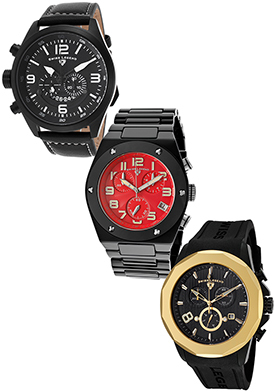 The Swiss Legend Highlander, Throttle and Monte Carlo trio bundle offers plenty of style options for today’s man. Bundle includes the Highlander chronograph with a robust 52mm diameter black ion-plated steel case, black chronograph dial with luminous hands and Arabic numeral hour makers and a black leather strap with contrasting white-stitched detail. The Throttle men’s chronograph has a high-tech black ceramic case and matching bracelet, bright red dial with luminous hands and Arabic numeral hour markers. The Monte Carlo chronograph features the 45mm diameter case in black ion-plated steel with a distinctive twelve-sided bezel in polished yellow gold-tone steel. 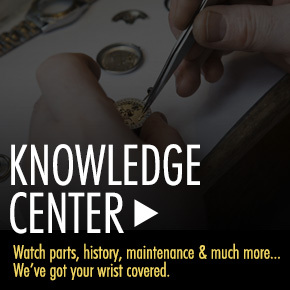 The black dial has three sub-dials, skeleton hands and raised baton hour markers. Each of the three chronographs in this bundle are water-resistant to 100 meters or 330 feet.